This article will build on to what I have written about this specific equity sector called REITs. Why should you invest in REITs? What are the advantages? What are the deeper considerations when you are an intermediate REIT investor? You can read them for FREE in my REIT Training Center here. If you have read up on the virtues and the disadvantages of investing in some REITs, you are ready to get started. The first step is to know how to purchase and sell REITs on a stock exchange in the first place. 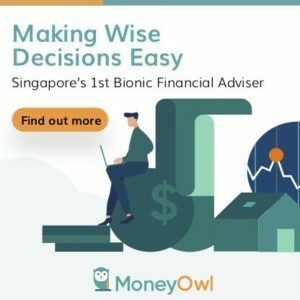 This is covered in this Beginner’s Guide – How to Buy and Sell Stocks, Bonds, REITs and ETFs in Singapore. The next question is: How do you go about obtaining the information you need to make sense of an individual REIT, a sub category of REIT and the REIT sector in general? What is this for: You wish to know what is the price of the REIT per unit it is trading at. You might also wish to know the historical price of the REIT per unit it was trading at in the past. This is to let you know whether the prices have gone up or come down. You will also wish to know the code or symbol representation of the REIT/stock. This is the short identifier that is used in various platforms. You can grab the prices of the latest REIT at a few places. 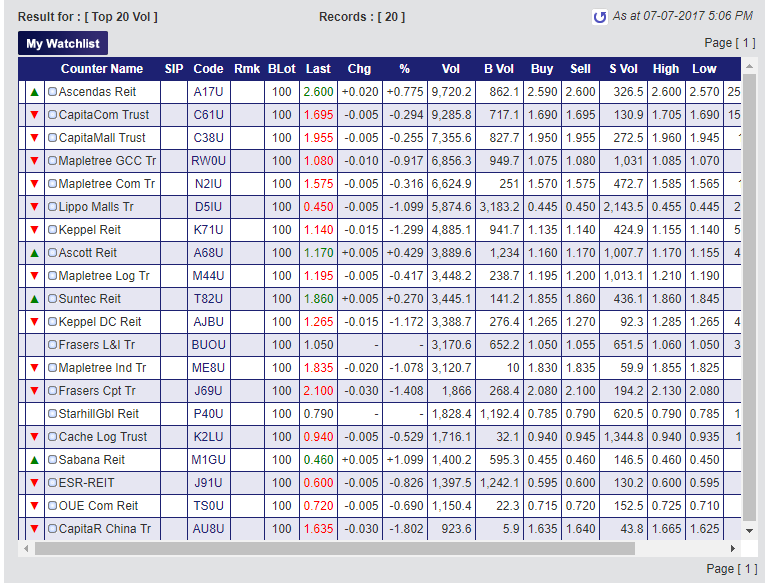 The first place that have price data is SGX over here. They have a whole section on the REITs that are listed. You can also find the daily high and low prices, the volume of buy and sell transactions. You can also find the symbol and quote here. For example Cache Log Trust’s symbol is K2LU. 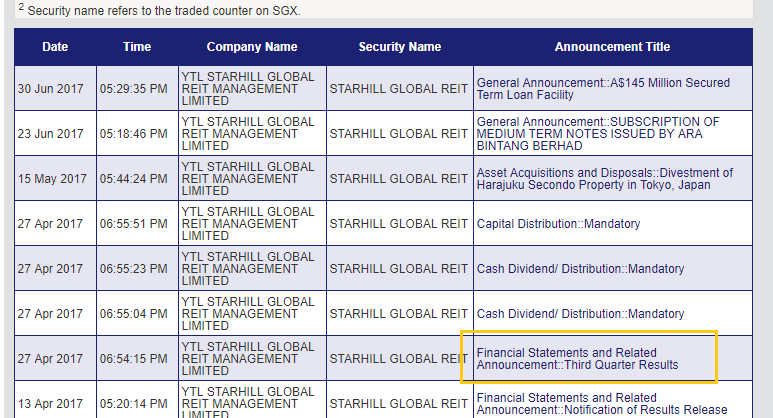 Starhill Global symbol is P40U. With this code and name of the stock, you can go to other platforms to find the historical prices. My favorite is Markets @ FT.com , which is short for Financial Times. 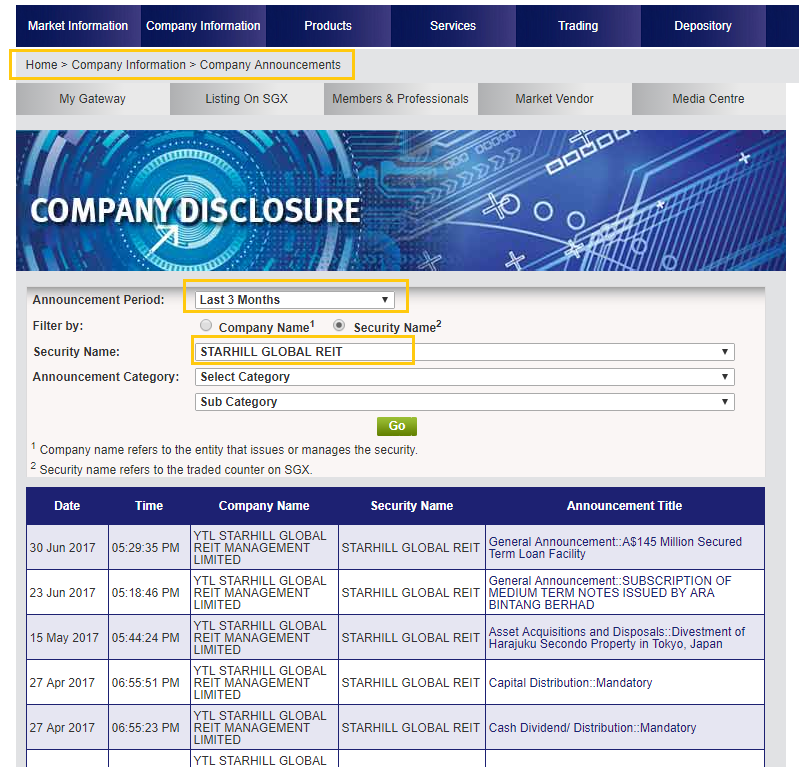 If you start typing the name of your REIT, into the search box, it will find the entry if it exist and you can retrieve its info. If you zoom out, and zoom in you can take a look at prices at various historical juncture. For the stocks in some countries you can even see data as far back as 1980s. One of the appeal of investing in REITs is that you can get some sort of a rental income. In the case of a REIT, then rental income is paid into the REIT and the REIT manager will decide how much of the cash flow the REIT earns will be paid out to you the shareholder as dividends. If you compute the dividend yield of the REIT, you can compare the yield against these financial assets/instruments. When you try to find out the historical dividend per unit, you are trying to find out how much dividends a particular REIT is paying in the past quarters or annually. The above is an example of Mapletree Industrial Trust’s historical corporate action. Here you can see the distribution declared, usually at every quarterly report. The ex-date is the date where if you get in before that date, you are eligible to receive the dividend. The particulars will show how much each declaration you can receive. So for example, on 31st Jan, a total of SGD 0.0001 + SGD 0.0282 = SGD 0.0283 is declared and paid out. 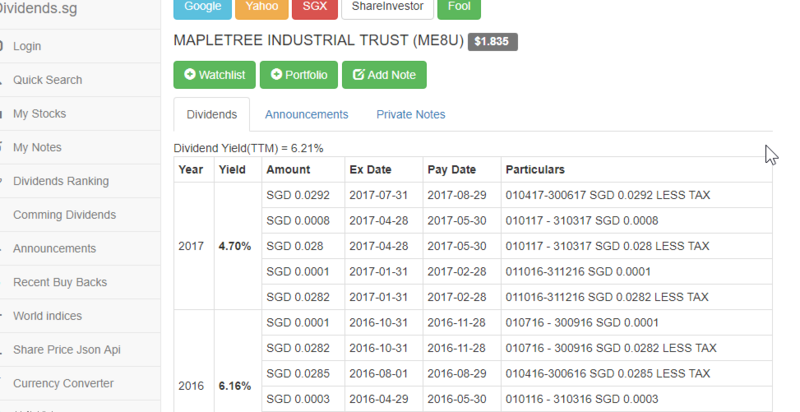 If the price of Mapletree Industrial Trust is at $1.88 the quarterly dividend yield is 0.0283 / 1.88 = 0.015 or 1.5%. Now usually we want to see how much is paid out in a year annually, so that you can estimate roughly what may be the future dividend yield. divide this annual distributions by current unit price of the REIT. 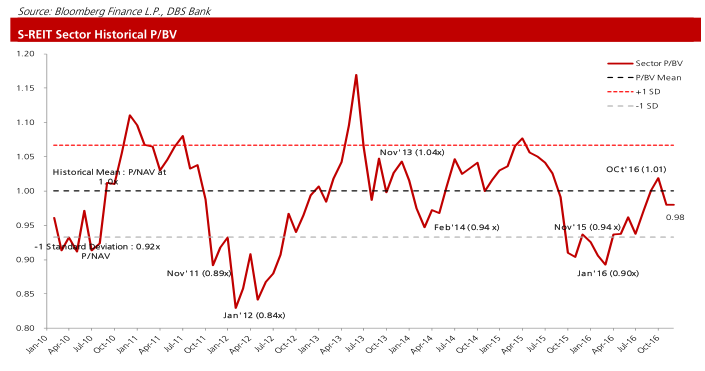 assume that current price is SGD 1.88, the annual dividend yield in the past 4 quarter is 0.1146/1.88 = 0.06 or 6%. Now what we just compute is based on the pay out of the last 4 quarters. In estimating the future there can be some variations. Suppose the latest few financial results show that the DPU is increasing or maintaining. You can estimate future dividend yield by assuming that the DPU per quarter would at least be higher than this current quarter’s DPU. So if 31 Jul 17 DPU is SGD 0.03, you can estimate future annual DPU to be $0.03 x 4 = $0.12. 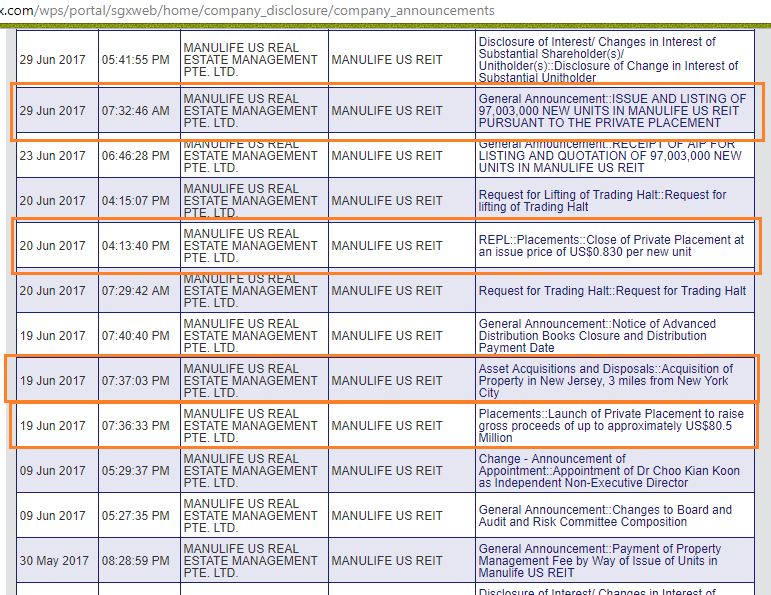 If this is a new REIT, it will not have any record of DPU in the corporate action. In the new REIT’s prospectus, it will have put out what is the forecast DPU. This is the DPU that the management is aiming for. You can use this forecast DPU and the current price per unit to compute the dividend yield. 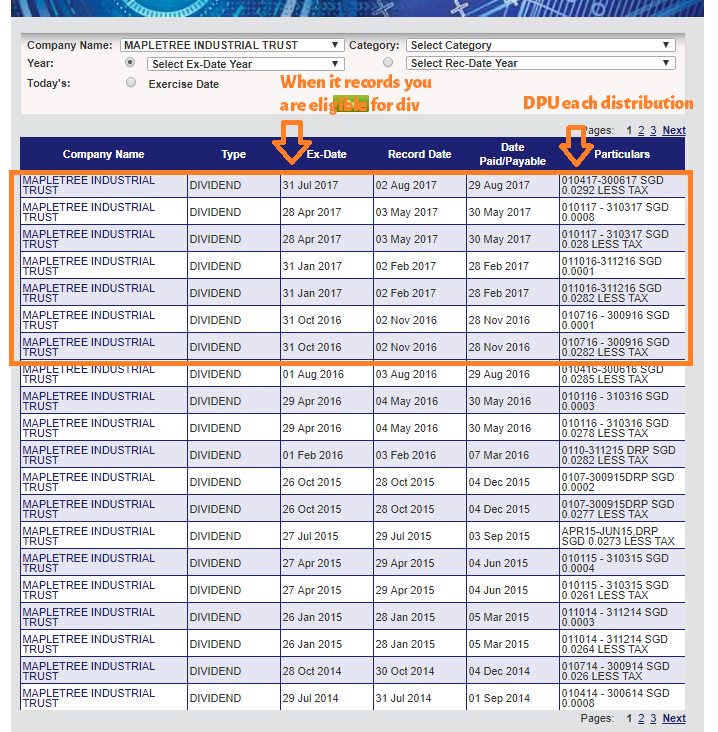 You can also find out for a particular calendar year, how much DPU the REIT paid out. This is done by adding up all the DPU in 2014 for example. You can draw a trend of the DPU growth since its IPO days. 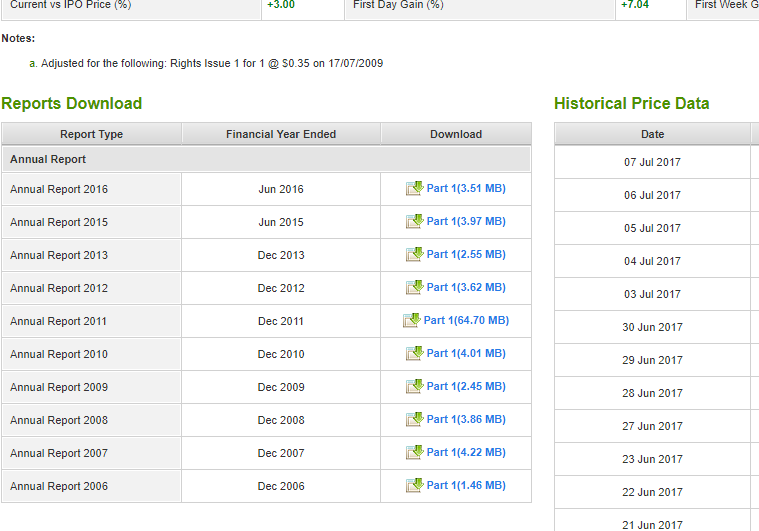 On my Dividend Stock Tracker, I have list out my estimate of the future DPU of REITs, based on the historical DPU. 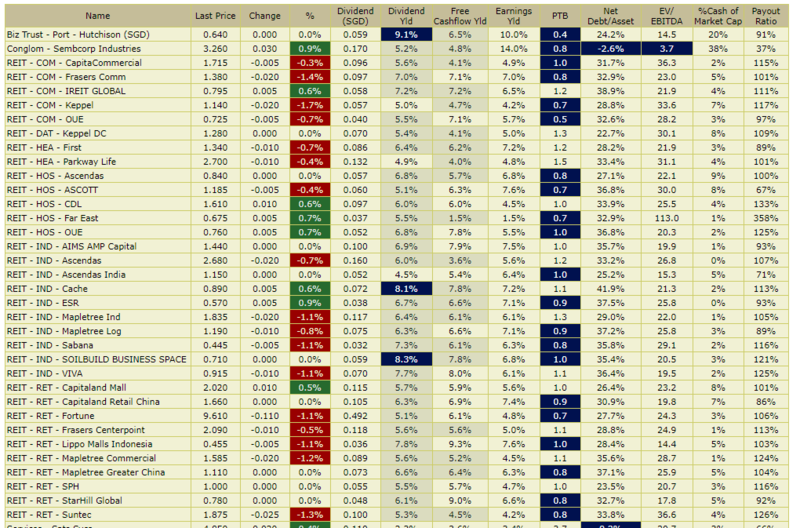 You can have a glimpse how the dividend yield of the REITs change as the price changes together with some other data. 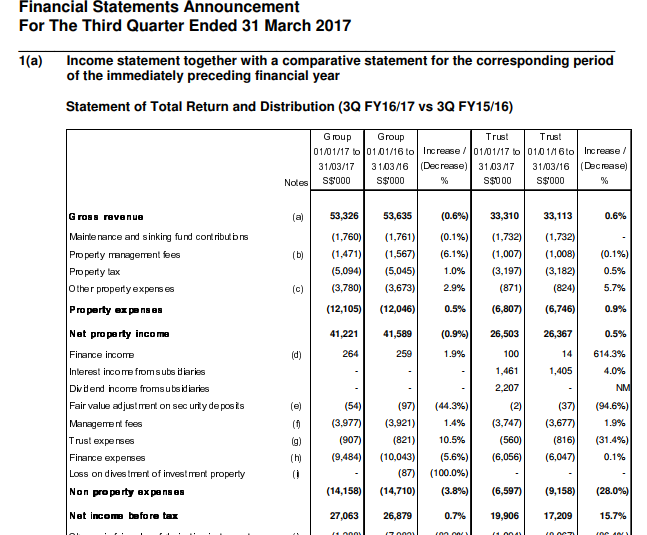 Someone created Dividends.sg and it is very nifty to see the dividend yield of a REIT. The TTM yield provides the dividend yield up to the year. I believe the guy crawl the data from the SGX.com Corporate actions site. Still the caveat is that, while this makes it very convenient for you, you have to know how to compute the annual DPU, just to validate what is the real historical dividend yield. What is this for: There is a business or company behind the REIT. It is not a piece of paper. How do we get to know and understand a prospective REIT we are interested in? We read the financial statements and third party reports to form a clearer view. The quarterly financial statement report the performance of the REIT for the last quarter. You can find it at the same announcement section. Media Release. Very short which is just a summary. The financials will provide the most detail view of the performance of the REIT. It is something for the REIT investor to analyze if they are serious about the investment. The presentation slide deck takes the detail information in the financials and put it in a more layman format. They will also provide information not found in the financials. The annual report is a report of the financial performance to the shareholders. It is an important document to review. 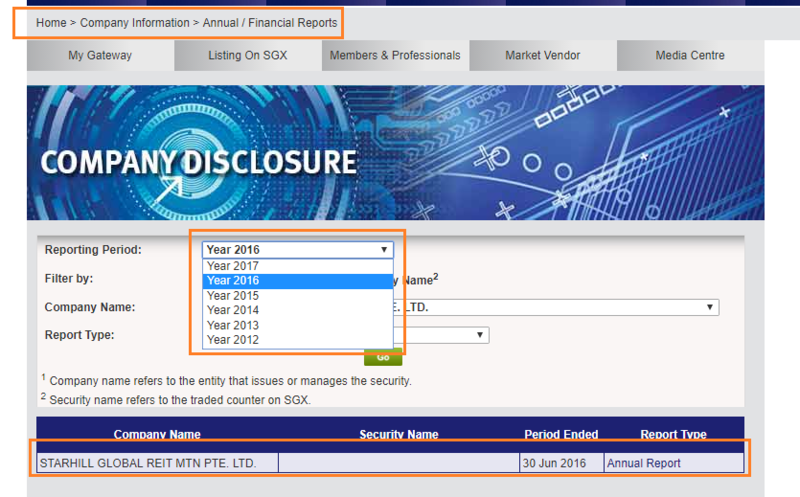 You will be alerted that the annual report is released at the SGX announcement section as well. 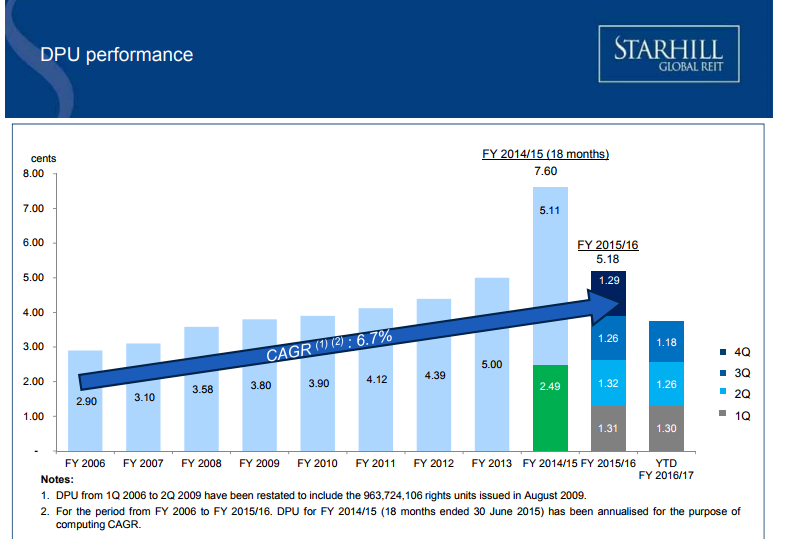 However, SGX have an annual report section that is more concise displaying the past annual reports. You can go to Corporate Information > Annual Reports to find and download them. Now notice there is only past 5 years of annual report. What if you want older quarterly financial and annual reports? What if you want to take a look at older financial and annual reports to find out more about this REIT in the initial stage? There are a few places you can take a look. Morningstar, the platform known for fund information aggregation provides these reports under filings. To get there fast, go to Google, then find “Morningstar Starhill Global”. You should be able to get a fast link to the page. Then go to fillings. You can find past quarterly and annual reports. Another place that only have older annual reports is Shareinvestor. 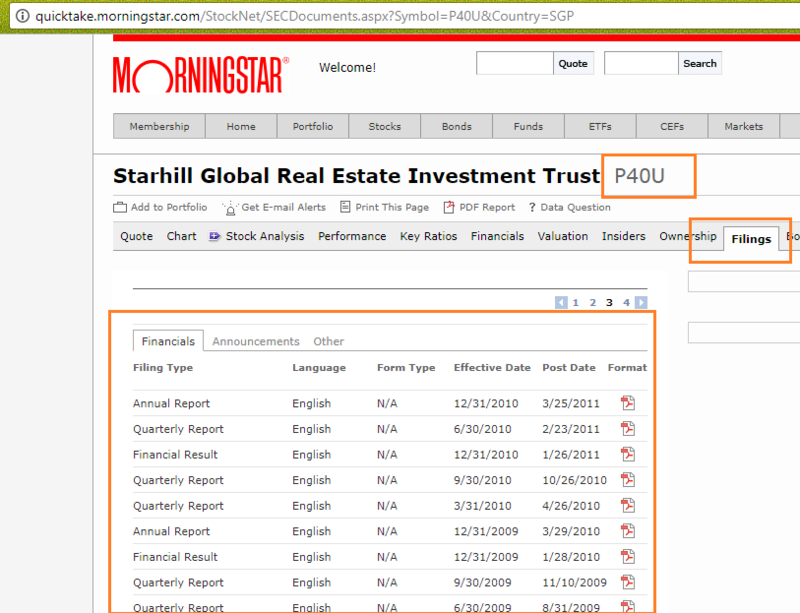 Shareinvestor is a paid platform, but somehow if you Google “Shareinvestor Starhill Global” and scroll all the way down you can download the older annual reports. Of course the last place you can possibly find the older reports is the Investor Relations of the Company itself. 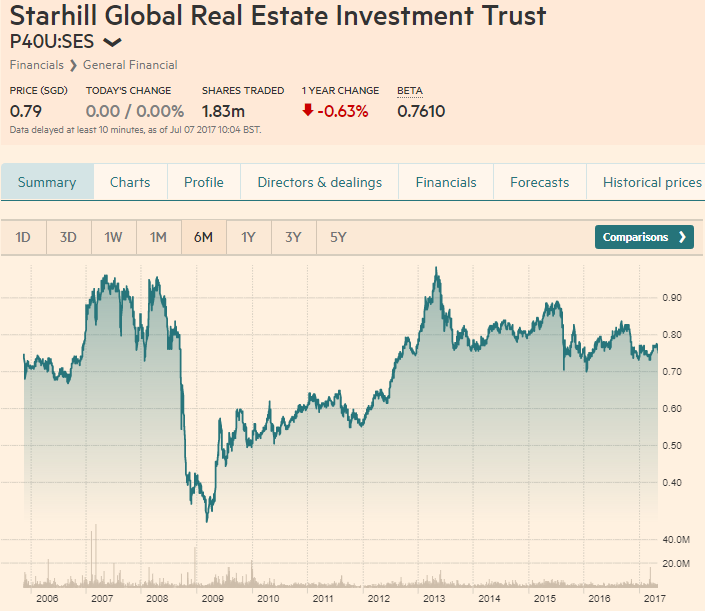 In this case go to Google and find Starhill Global REIT’s own site and there should be an investor relations section. You would want to keep track and read up on these detail information. You can find these in the same Corporate Information > Corporate Announcement section. The example above shows the announcement related to Manulife US REIT’s latest placement for their New Jersey acquisition. The documents are within the links. 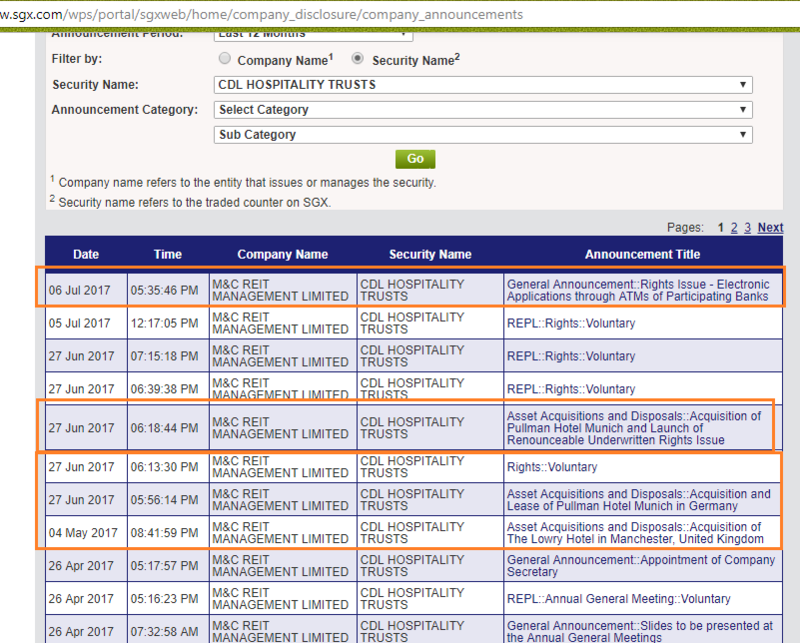 The example above shows the announcements leading up to CDL Hospitality Trust’s rights issue to acquire their latest hotels. The documents are within the links. To find out more about the company, we can look to their company website. Most if not all of these listed REITs, own their own web portal. 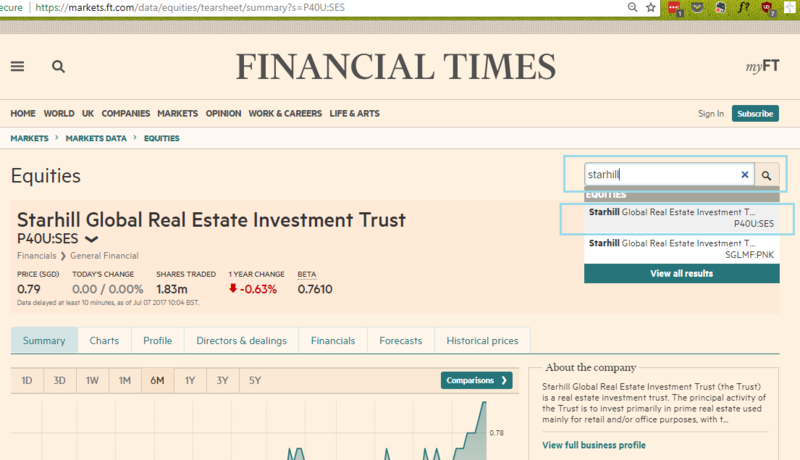 You can find more consolidated information about the REITs there. 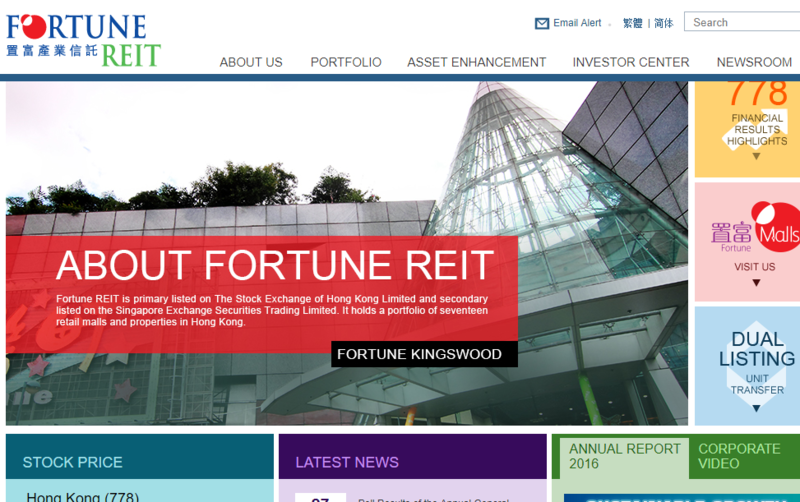 You can find commentaries on the REITs in newspapers and financial publications. To generate buy and sell transactions, brokerage firms and banks would publish reports that advise the retail investor. If you ignore the buy and sell calls, and target prices, these reports contain good information that help you when you are starting out. It lets you have an idea how the analysts look at these REITs, how do they value the REITs, and what are the metrics that they focus upon. The metrics and information may be correct or wrong. When you start off, most of the stuff looks like the truth. You can get these reports from your broker. They will typically have a bunch of these reports. Some of the detail reports can be very big. 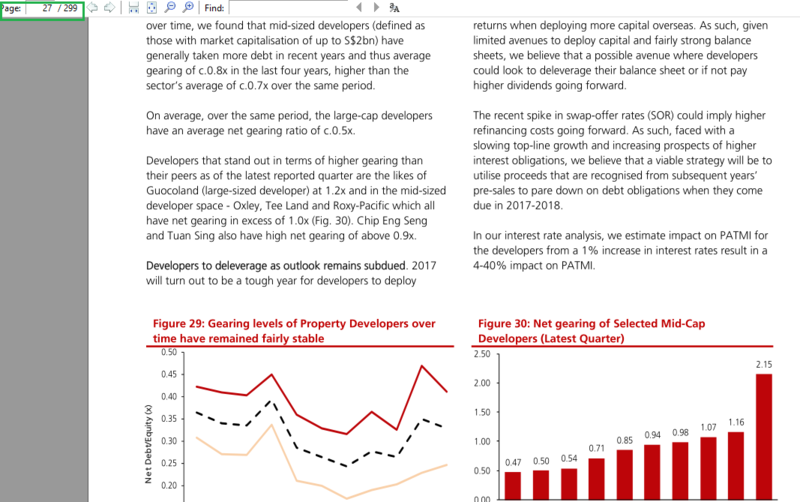 In this example, the report is 299 pages, containing updates on how the REITs and property developers will react to the increase in interest rates. These reports could collate some industry data that is hard to source on your own. 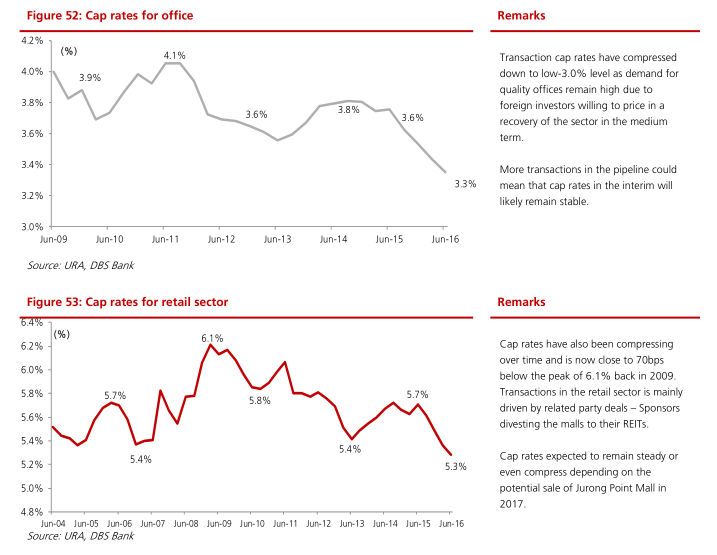 The example above shows the CAP Rate trend for commercial and retail sector over time. The CAP Rate indicates the market rental yield for the properties. The reports also provides collated metrics that allows you to visualize the valuation of the REITs in the cycle. In this graph above, it shows the historical price to book value, one of the common metrics analyst used to value whether the REITs are more expensive, more cheap or fairly value. In the graphs above on the left, it shows the historical dividend yield of Capitaland Commercial Trust from 2010 to 2015. It also shows the yield spread between Capitaland Commercial Trust minus the 10 year Singapore Government Bond Yield. With this list, you should know where to get the current and historical information, internal and external information so that you can start evaluating REITs. If I have missed out anything, do let me know. In SGX’s Stock fact, there is lots of information about the company.